Most of the time, when we say a child is constipated, it means the child passes bowel movements less than every 2-3 days, bowel movements are often large and hard, and perhaps most importantly, it hurts to pass a bowel movement. Everybody is different, so what is normal for one person may not be normal for another person. When we talk about normal bowel habits, we are talking about averages. It is important to remember that no matter how often a child passes a bowel movement, it shouldn’t hurt! During the first several months of life, babies generally pass bowel movements between every other day and four times each day. Breast-fed babies tend to pass bowel movements more often than babies who are fed formula. It is not unusual for a breast-fed baby to pass a bowel movement with every feeding. By about two years of age, most children pass one bowel movement every day. 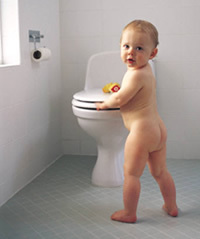 95% of children two years or older pass between one bowel movement every other day and two bowel movements a day. Remember, these are only averages, and just because a child goes more or less often than average doesn’t mean there is something wrong!